10pc Stainless Steel BBQ Set only $11.99 Shipped! (Reg. $64.99) Today Only! You can get Father's Day shopping done today with the great deal you can get at Sears.com! Today only, you can get an Ace 10-piece stainless steel BBQ set for only $11.99 shipped. This regularly costs $64.99! This set is made of a brushed wood finish and stainless steel material. 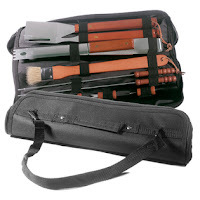 It includes: grilling tongs, grilling fork, grilling spatula, basting brush, 4 corn cob holders, 2 skewers, black zip carry case with handle with an adjustable removable shoulder strap.